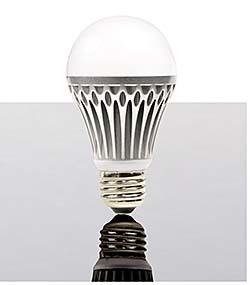 The 11-Watt LED A is a versatile, fully dimmable lamp that is designed for a broad range of commercial applications. It saves up to 90 percent in energy while replacing a 60-Watt (W) incandescent lamp and delivers a substantial efficacy of 72 lumens per W. The lamp's LEDs are matched for color and Color Rendering Index to ensure consistency and quality. The lumen maintenance is enhanced by the housing, which acts as a heat sink to provide thermal heat conductivity and maintain a low junction temperature.